"Dallas–Fort Worth" redirects here. For the airport, see Dallas/Fort Worth International Airport. The Dallas–Fort Worth metroplex (officially designated the Dallas–Fort Worth–Arlington, TX Metropolitan Statistical Area by the U.S. Office of Management and Budget) encompasses 13 counties within the U.S. state of Texas. Residents of the area also refer to it as DFW, or the Metroplex. It is the economic and cultural hub of the region of North (North Central) Texas, and it is the largest inland metropolitan area in the United States. The Dallas–Fort Worth metroplex's population is 7,399,662 according to the 2017 U.S. Census estimate, making it the largest metropolitan area in both Texas and the South, the fourth-largest in the U.S., and the seventh-largest in the Americas. In 2016, DFW ascended to the number one spot in the nation in year-over-year population growth. In 2016, the metropolitan economy surpassed Houston to become the fourth-largest in the nation, currently the region boasts a GDP of just over $613.4 billion in 2019. As such, the metropolitan area's economy is ranked 10th largest in the world. The region's economy is primarily based on banking, commerce, telecommunications, technology, energy, healthcare and medical research, and transportation and logistics. In 2017, Dallas–Fort Worth is home to 24 Fortune 500 companies, the third-largest concentration of Fortune 500 companies in the nation, behind New York City (63) and Chicago (34). The metroplex encompasses 9,286 square miles (24,100 km2) of total area: 8,991 sq mi (23,290 km2) is land, while 295 sq mi (760 km2) is water, making it larger in area than the states of Rhode Island and Connecticut combined. A portmanteau of metropolis and complex, the term metroplex is credited to Harve Chapman, an executive vice president with Dallas-based Tracy-Locke which was one of three advertising agencies that worked with the North Texas Commission (NTC) on strategies to market the region. The NTC copyrighted the term "Southwest Metroplex" in 1972 as a replacement for the previously-ubiquitous "North Texas", which studies had shown lacked identifiability outside the state. In fact, only 38 percent of a survey group identified Dallas and Fort Worth as part of "North Texas", with the Texas Panhandle also a perceived correct answer, being the northernmost region of Texas. Note: Cities and towns are categorized based on the latest population estimates from the North Central Texas Council of Governments (as of January 1, 2018). No population estimates are released for census-designated places (CDPs), which are marked with an asterisk (*). These places are categorized based on their 2010 census population. Places designated "principal cities" by the Office of Management and Budget (OMB) are italicized. As of the 2010 United States census, there were 6,371,773 people. The racial makeup of the MSA was 50.2% White, 15.4% African American, 0.6% Native American, 5.9% Asian, 0.1% Pacific Islander, 10.0% from other races, and 2.4% from two or more races. Hispanic or Latino of any race were 27.5% of the population. The median income for a household in the MSA was $48,062, and the median income for a family was $55,263. Males had a median income of $39,581 versus $27,446 for females. The per capita income for the MSA was $21,839. The Dallas–Fort Worth, TX–OK Combined Statistical Area is made up of 20 counties in north central Texas and one county in southern Oklahoma. The statistical area includes two metropolitan areas and seven micropolitan areas. As of the 2010 Census, the CSA had a population of 6,817,483 (though a July 1, 2015 estimate placed the population at 7,504,362). The CSA definition encompasses 14,628 sq mi (37,890 km2) of area, of which 14,126 sq mi (36,590 km2) is land and 502 sq mi (1,300 km2) is water. Note: The Granbury micropolitan statistical area (Hood and Somervell counties) was made part of the Dallas–Fort Worth–Arlington, Texas Metropolitan Statistical Area effective 2013. As of the census of 2000, there were 5,487,956 people, 2,006,665 households, and 1,392,540 families residing within the CSA. The racial makeup of the CSA was 70.41% White, 13.34% African American, 0.59% Native American, 3.58% Asian, 0.08% Pacific Islander, 9.62% from other races, and 2.39% from two or more races. Hispanic or Latino of any race were 20.83% of the population. It is home to the fourth-largest Muslim population in the country. The median income for a household in the CSA was $43,836, and the median income for a family was $50,898. Males had a median income of $37,002 versus $25,553 for females. The per capita income for the CSA was $20,460. The metroplex overlooks mostly prairie land with a few rolling hills dotted by man-made lakes cut by streams, creeks and rivers surrounded by forest land. The metroplex is situated in the Texas blackland prairies region, so named for its fertile black soil found especially in the rural areas of Collin, Dallas, Ellis, Hunt, Kaufman, and Rockwall counties. Many areas of Denton, Johnson, Parker, Tarrant, and Wise counties are located in the Fort Worth Prairie region of North Texas, which has less fertile and more rocky soil than that of the Texas blackland prairie; most of the rural land on the Fort Worth Prairie is ranch land. A large onshore natural gas field, the Barnett Shale, lies underneath this area; Denton, Tarrant and Wise counties feature many natural gas wells. Continuing land use change results in scattered crop fields surrounded by residential or commercial development. South of Dallas and Fort Worth is a line of rugged hills that goes north to south about 15 miles (24 km) that looks similar to the Texas Hill Country 200 miles (320 km) to the south. The cities of Dallas and Fort Worth are the two central cities of the metroplex, with Arlington being a third economically important city; it is a center for sporting events, tourism and manufacturing. Most other incorporated cities in the metroplex are "bedroom communities" serving largely as residential and small-business centers, though there are several key employers in these regions. Due to the large number of smaller, less well-known cities, metroplex residents commonly divide the region roughly in half along Texas Interstate 35, which runs north-south, splitting into two 'branches' (I-35E in Dallas and I-35W in Fort Worth) through the metroplex. They refer to places as being on the "Dallas side" or the "Fort Worth side", or in "the Arlington area", which is almost directly south of the airport. It is nominally between the two major east-west interstates in the region (I-20, passing to the south of both downtowns, and I-30, connecting Dallas and Fort Worth city centers). Dallas and its suburbs have one of the highest concentrations of corporate headquarters in the United States. Business management and operations is a major part of the economy. The metroplex also contains the largest Information Technology industry base in the state (often referred to as Silicon Prairie or the Telecom Corridor, especially when referring to US-75 through Richardson just north of Dallas itself). This area has a large number of corporate IT projects and the presence of numerous electronics, computing and telecommunication firms such as Microsoft, Texas Instruments, HP Enterprise Services, Dell Services, Nokia, Cisco, Fujitsu, i2, AT&T, Alcatel-Lucent, Ericsson, CA, Google, and Verizon in and around Dallas. On the other end of the business spectrum, and on the other side of the metroplex, the Texas farming and ranching industry is based in Fort Worth. According to the Dallas Business Journal 's 2006 Book of Lists, American Airlines is the largest employer in the metroplex. Several major defense manufacturers, including Lockheed Martin, Bell Helicopter Textron, and Raytheon, maintain significant operations in the metroplex, primarily on the "Fort Worth side." They are concentrated along State Highway 170 near I-35W, commonly called the "Alliance Corridor" due to its proximity to the Fort Worth Alliance regional airport. ExxonMobil, the #2 corporation on the Fortune 500 listings, is headquartered in Irving, Texas. Toyota USA, in 2016, relocated its corporate headquarters to Plano, Texas. Southwest Airlines hold their headquarters in Dallas. The airline has more than 53,000 employees as of October 2016 and operates more than 3,900 departures a day during peak travel season. In October 2016, Jacobs Engineering, a Fortune 500 company and one of the world’s largest engineering companies, relocated from Pasadena, California to Dallas. Changes in house prices for the metroplex are publicly tracked on a regular basis using the Case–Shiller index; the statistic is published by Standard & Poor's and is also a component of S&P's 20-city composite index of the value of the U.S. residential real estate market. Since the late 20th century and the realignment of party affiliations, white conservatives have shifted to the Republican Party, and its national candidates have won in the Dallas–Fort Worth area, including in presidential elections. Democratic voters dominate a majority of areas in the large cities of Dallas, Fort Worth, Grand Prairie, and Arlington (especially areas east of Interstate 35W). Republicans dominate North Dallas, western Fort Worth and the rest of Tarrant County, most suburbs, and the rural areas of the metroplex. The Dallas/Fort Worth International Airport (IATA airport code: DFW), located between the cities of Dallas and Fort Worth, is the largest and busiest airport in the state of Texas. At 17,207 acres (6,963 ha) of total land area, DFW is also the second-largest airport in the country and the sixth-largest in the world. It is even the third-busiest airport in the world in terms of aircraft movements and the world's seventh-busiest by passenger traffic, transporting 62.9 million passengers in FY 2014. Based in Fort Worth, American Airlines' headquarters are adjacent to DFW. Recently having regained the title as the largest airline in the world in terms of both passengers transported and fleet size, American is a predominant leader in domestic routes and operations. 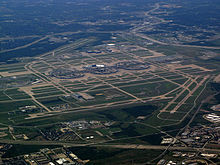 Love Field Airport (IATA airport code: DAL) is located in northwest Dallas. Based in Dallas, Southwest Airlines is headquartered next to Love Field. The Dallas–Fort Worth area has thousands of lane-miles of freeways and interstates. The metroplex has the second-largest number of freeway-miles per capita in the nation, behind only the Kansas City Metropolitan Area. As in most major metropolitan areas in Texas, most interstates and freeways have access or frontage roads where most of the businesses are located; these access roads have slip ramps allowing traffic to transition between the freeway and access road. North-south interstates include I-35 and I-45. East-west routes include I-30 and I-20. I-35 splits into I-35E and I-35W from Denton to Hillsboro: I-35W goes through Fort Worth while I-35E goes through Dallas. (This is one of only two examples of an interstate splitting off into branches and then rejoining as one; the other such split is in Minneapolis-St. Paul where I-35E goes into St. Paul and I-35W goes through Minneapolis.) I-30 connects Dallas and Fort Worth, and I-45 connects Dallas to Houston. The "multiple-of-5" numbers used for the interstate designations are notable, as these numbers were designed to be used for major multi-state arteries of the U.S. Interstate Highway System. The North Texas region is the terminus for two of them, and I-45 is located only within Texas. HOV lanes exist along I-35E, I-30, I-635, US 67, and US 75. I-20 bypasses both Dallas and Fort Worth to the south while its loop, I-820, goes around Fort Worth. I-635 splits to the north of I-20 and loops around east and north Dallas, ending at SH 121 north of DFW Airport. I-35E, Loop 12, and Spur 408 ultimately connect to I-20 southwest of Dallas, completing the west bypass loop around Dallas. A large number of construction projects are planned or are already underway in the region to alleviate congestion. Due largely to funding issues, many of the new projects involve building new tollways or adding tolled express lanes to existing highways, which are managed by the North Texas Tollway Authority. It was originally established to manage the Dallas North Tollway and oversees several other toll projects in the area. Public transit options continue to expand significantly throughout the metroplex. However, it is limited in several outlying and rural suburbs. Dallas County and portions of Collin and Rockwall counties have bus service and light rail operated by Dallas Area Rapid Transit (DART), covering thirteen member cities. DART's rail network currently sprawls for 93 miles throughout the area. The Red Line extends north to Plano and southwest to Westmoreland Road. The Blue Line reaches from Rowlett in the northeast to the University of North Texas at Dallas campus near I-20 in the south. The 28-mile Green Line, which opened in December 2010, connects Carrollton in the northwest through Downtown Dallas to Pleasant Grove in the southeast. The Orange Line, which completed expansion in 2014, parallels the Red Line from Plano to Downtown Dallas and the Green Line from Downtown Dallas to Northwest Hwy before extending through the Las Colinas area of Irving to reach DFW International Airport. Denton County has bus service limited to Denton, Highland Village, and Lewisville (with commuter service to downtown Dallas) provided by the Denton County Transportation Authority (DCTA). The A-train, a diesel commuter rail line, parallels I-35E to connect Denton, Highland Village, Lewisville, and Carrollton. Several smaller towns along this line, Corinth, Shady Shores, and Lake Dallas, voted to abstain from DCTA and do not have stations. There is an across-the-platform transfer in Carrollton to the DART Green Line. A-Train service began June 20, 2011. Tarrant County has bus services operated by Trinity Metro (formerly the Fort Worth Transportation Authority, popularly known as 'The T'), available only in Fort Worth. It additionally operates TEXRail commuter rail, which serves to connect downtown Fort Worth with DFW Airport and the DART Orange Line. The diesel commuter train that serves Fort Worth and its eastern suburbs is operated as the Trinity Railway Express; it connects downtown Fort Worth to downtown Dallas, where it links to the DART light rail system. A station near its midpoint, Centerport, also serves DFW Airport via a free airport shuttle bus. The TRE is jointly owned by FWTA and DART. Amtrak serves two stations in the Metroplex - Dallas Union Station and Fort Worth Intermodal Transportation Center. Both are served by the Texas Eagle route, which operates daily between Chicago and San Antonio (continuing on to Los Angeles three days a week), though only the latter station is served by the Fort Worth-Oklahoma City Heartland Flyer. As of 2016 the Taiwanese airline EVA Air operates a shuttle bus service from George Bush Intercontinental Airport in Houston to Richardson, so that Dallas-based customers may fly on its services to and from Houston. The cities of Dallas and Fort Worth have their own newspapers, The Dallas Morning News and the Fort Worth Star-Telegram, respectively. Historically, the two papers had readership primarily in their own counties. As the two cities' suburbs have grown together in recent years (and especially since the demise of the Dallas Times Herald in 1991), many sites sell both papers. This pattern of crossover has been repeated in other print media, radio, and television. Since the 1970s all of the television stations and most of the FM radio stations have chosen to transmit from Cedar Hill so as to serve the entire market, and are programmed likewise. There has been a rise in "80–90 move-ins", whereby stations have been moved from distant markets, in some cases as far away as Oklahoma, and relicensed to anonymous small towns in the metroplex to serve as additional DFW stations. According to RadioTime, the market has 38 AM stations, 58 FM stations (many of them class Cs), and 18 full-power television stations. Dallas–Fort Worth is the fifth-largest television market in the United States, behind only New York City, Los Angeles, Chicago, and Philadelphia. Two metroplex AM radio stations, 820 WBAP and 1080 KRLD, are 50,000-watt stations with coverage of much of the North American continent and beyond during nighttime hours. The South Asian population (Indian Sub-continent) has increased considerably in the DFW metroplex. They have the FM 104.9 radio channel and 700 AM radio. Recently Sony TV, a subsidiary of Sony TV Asia, launched its FTA (free to Air OTA) channel on 44.2 station in DFW. It was one of the two locations they chose in USA; the other being NYC, where there is also a large South Asian demographic. The following are full-powered stations serving the Dallas–Fort Worth television market. Network owned-and-operated stations are highlighted in bold. 18.1 KPFW-LD Hope Channel broadcasting None Dallas Iglesia JesuCristo es mi Refugion, Inc.
25.1 K25FW-D HSN None Corsicana, TX Ventana Television, Inc. The metroplex is one of the twelve American metropolitan areas that has a team in each of the four major professional sports leagues. Major professional sports first came to the area in 1952, when the Dallas Texans competed in the National Football League for one season. In 1960, major professional sports returned when The Dallas Cowboys began competing in the National Football League and the Dallas Texans began competing in the American Football League. (The Texans later relocated to Kansas City and became the Chiefs). In 1972, Major League Baseball's Washington Senators moved to Arlington to become the Texas Rangers, named after the statewide law enforcement agency. The National Basketball Association expanded into North Texas in 1980 when the Dallas Mavericks were added to the league. The fourth sport was added in 1993 when the Minnesota North Stars of the National Hockey League moved to Dallas, becoming the Dallas Stars. The Major League Soccer team FC Dallas is based in Frisco, and the Dallas Wings of the WNBA play in Arlington. The area is also home to many minor-league professional teams, and four colleges that compete in NCAA Division I athletics. Two Monster Energy NASCAR Cup Series races are hosted annually at Texas Motor Speedway, the Duck Commander 500 and the AAA Texas 500. The metroplex has hosted many premiere sports events on both an annual and one-time basis. Note: Venues are listed with their current names, not necessarily those in use when an event took place. ^ This has been rendered various different ways, with and without capitalization, with hyphens or slashes instead of dashes, and with or without spaces around those marks, and in abbreviated forms, sometimes without "Arlington", such as "Dallas–Forth Worth–Arlington MSA", "Dallas–Fort Worth Metropolitan Area", "Dallas–Fort Worth–Arlington Statistical Area", "Dallas–Fort Worth–Arlington Metro Area", "Dallas–Fort Worth Area", etc. The term is often rendered, especially in government documents, as "Dallas–Fort Worth–Arlington, TX Metropolitan Statistical Area", "Dallas–Fort Worth–Arlington, TX (MSA)", "Dallas–Fort Worth–Arlington, TX Metro Area", etc., using the US Postal Service code "TX" for Texas, and often without the syntactically expected comma after "TX". Other versions include the full word "Texas", and some give a shortened but redundant form such as "Dallas Area, Texas (Metro Area)". Other words are sometimes used, e.g. "Dallas–Fort Worth–Arlington Urbanized Area". ^ Bureau, U.S. Census. "American FactFinder – Results". factfinder.census.gov. Archived from the original on May 12, 2016. Retrieved 2016-05-10. ^ "Dallas–Fort Worth–Arlington, TX MSA Population". U.S. Census Bureau. Retrieved March 23, 2017. ^ "Core-Mark's California-to-Texas migration means 100 jobs for Westlake". Dallas News. 2018-09-07. Retrieved 2019-02-23. ^ "McKesson, nation's sixth largest company, is moving corporate HQ from California to Irving". Dallas News. 2018-11-30. Retrieved 2019-02-23. ^ "Greater Houston Partnership Research" (PDF). ^ Alsobrook, Bruce. "Harve Chapman’s left an indelible mark on North Texas, failing at only one goal he’s set for himself: Retirement," The Sulphur Springs (TX) News-Telegram, Saturday, December 10, 2011. ^ North Texas Commission. "History". Archived from the original on 4 October 2013. Retrieved 1 October 2013. ^ North Texas Commission (1 January 2002). ""Dallas/Fort Worth Metroplex" brand serves region well". Archived from the original on December 28, 2004. Retrieved 27 June 2006. ^ "OMB Bulletin No. 17-01: Revised Delineations of Metropolitan Statistical Areas, Micropolitan Statistical Areas, and Combined Statistical Areas, and Guidance on Uses of the Delineations of These Areas" (PDF). United States Office of Management and Budget. August 15, 2017. Retrieved January 2, 2018. ^ Population by City. North Central Texas Council of Governments, 2018. Retrieved 2018-05-19. ^ "2010 Census: Population of Texas Cities Arranged in Alphabetical Order". Texas State Library and Archives Commission. Retrieved 2012-09-05. ^ "OMB Census". arlingtonTX.gov. Retrieved November 12, 2012. ^ "Table 2. Annual Estimates of the Population of Combined Statistical Areas: April 1, 2010 to July 1, 2012". 2012 Population Estimates. United States Census Bureau, Population Division. March 2013. Archived from the original (CSV) on May 17, 2013. Retrieved April 19, 2013. ^ Carlisle, Candace. "Global engineering firm to relocate headquarters from California to Dallas". bizjournals.com. Dallas Business Journal. ^ "2016 election: Division in a key Texas Republican stronghold?". star-telegram. Retrieved 2016-11-23. ^ "Tarrant County: 2016 election results by precinct". ^ IATA. "IATA – Page not found". iata.org. Archived from the original on 2011-06-12. Retrieved 2012-02-17. ^ "About – Trinity Railway Express (TRE)". Trinity Railway Express. Archived from the original on 2012-02-04. Retrieved 2013-04-22. ^ "Dallas – Houston – Dallas Free Shuttle Service Schedule." EVA Air. Retrieved on February 29, 2016. ^ "North Texas Largest Employers". bizjournals.com. Dallas Business zJournal. July 16, 2016. ^ Name (Required):. "Sony launches free-to-air SAB TV in the US". Rapid TV News. Retrieved 2013-04-22.